ExFAT file system Recovery, recover files from ExFAT partition,ExFAT file recovery software on Windows 7/8/vista/XP free to recover files (word document,pictures,videos,excel,pdf,etc.) from lost, damaged, formatted, deleted Exfat partitions or lost data due to not formatted , not recognized , not working ,not showing up, power failure,logical damaged. Use "unformat" to recover data from formatted Exfat partition after quick format,full format,accidentally formatted,reformatting,High-level formatting,Low-level formatting. ,lost Exfat partition,changed Exfat partition,damaged Exfat partition.And if the size or position of Exfat partition is changed by format,It can not recover with "unformat" ,so you can use "recover partition" mode. Use "undelete" to recover deleted files from Exfat partition after Virus attack,Recycle bin clear,disk cleanup,Press shift del by mistake,permanently empty recycle bin,shift delete ,accidentally deleted by a mistake. Use "Full Scan" to recover Exfat deleted files which can not be found with with "undelete" and "unformat" and "recover partition",recover files from Exfat partition,recover files of partitons which are not NTFS,nor exfat,nor fat32.after showing an error,display as raw file system,unformatted,unknown partition,unpartitioned,needs to be formatted With deep and full scan lost data from Exfat partition , hard drive, usb. completely recover all data from hard drive. Do not write any information to your partitions again after formatting, or your data will be covered by rewriting. Please pay attention to some of the softwares which will be installed automatically to the default directory. Generally speaking, it has a great opportunity (almost 100%) to recover the NTFS partition; but unfortunately, you can just recover a part of the hard drive, for example: the files not larger than 100MBs, such as pictures, tables, documents; the recovery opportunity will be greater when the partition has been converted from FAT32 to NTFS. You may use aidfile data recovery to recover your data, choose "Unformat" and click "Next" to scan your lost data and file. Aidfile supports the file system : FAT32, NTFS and EXFAT. Get back files after a exfat partitioning error or hard disk crash. Recover data from lost or formatted or deleted exfat partitions. USB drive, memory card, memory stick, camera card, Zip, floppy disk or other storage media. support Microsoft Windows 10 Enterprise,Microsoft Windows 10 Home Premium (32/64 bits),Microsoft Windows 10 Professional 64-bit Edition,Microsoft Windows 10 SP1,Microsoft Windows 10 Starter,Microsoft Windows 10 Ultimate 64-bit Edition,Windows 10 32 bit and Windows 10 64 bit , Windows XP, Windows 7, Windows 8,Windows 8.1, Windows Vista, Windows 2003, 2008, 2012. Aidfile data recovery has the capability to recover the deleted data and files which are deleted unintentionally from the exfat file system. Aidfile can recover the permanent deleted data which deleted by using "shift+del", it can recover formatted data, quick formatted data, complete formatted data, unformatted data under exfat file system. The most amazing part is that it can recover the partition which has been formatted and even been changed, for example: the cluster of the file system has been changed. Among others, Aidfile can recover the data in the partition which has been formatted from exfat to fat32,recover the partition has been formatted from exfat to exfat, recover the partition has been formatted from exfat to ntfs, and it even can recover the data formatted both from ntfs to exfat and fat32 to exfat. As a powerful data recovery software, aidfile recovery can recover the data from all kinds of storage devices, such as hard drive, portable hard drive which made by Seagat, Sumsung, Weastern digital, and so on. Aidfile can recover any kinds of usb devices, and memory cards without a question. But the possibility to recover them is connecting to the data's status. 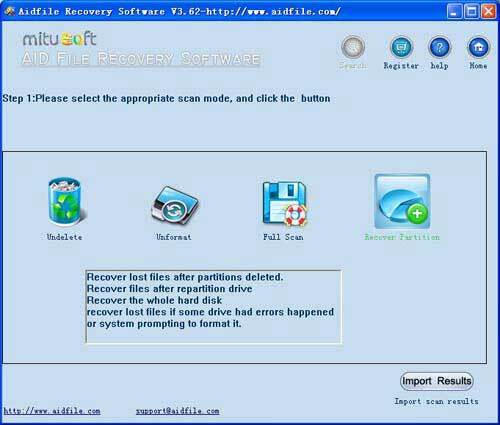 Aidfile data recovery software is developed under Windows operating system, it support most of the windows series operating system such as windows XP,windows 2003 server,windows 2008 server,windows vista,windows 7, windows 8,and so on. What should be mentioned are: Exfat cannot work under the Windows XP which without KB955704 patch, it also will work before your windows vista has been updated to SP1.